It’s true! CJ’s Catherine Cady Skye, TDI (a Cade\Blue Echo offspring,) owned and trained by Martha Wescott, actually reads words, symbols, figures and photographs. Following a method discussed in the book, “Teach your Dog to Read,” by Bonnie Bergin, EdD, Cady very quickly showed great aptitude for this remarkable skill. "In this picture, you see that she is looking at a drawn figure of a dog sitting. She will demonstrate that she understands the meaning of a word or figure by doing what the figure depicts or what the word means. Now see the picture below where she has sat! She recognizes this type of figure for: Sit, Stand, Down, Go to Mat, Shake (offer a paw,) and Bow. She also responds to a drawn figure of a shepherd with a circle and a slash through it. At this “No Dogs Allowed” symbol, she knocks the card out of my hands! Cady reads the words: Sit, Down, Stand, Touch It, Touch Ball, Touch Toy, Paw, Back, Come, Step, Go Lay Down, Nighty Nite, Zen (which means not to touch the card,) Speak, Stop, Swing and Finish. She reads and reacts to these in rapid succession! She is working with traffic-type signals and responds now to a green light and stop sign. (This is in preparation for her learning to drive!) She recognizes the universal sign for Rest Room and will head to the nearest one. She is working on what to do when asked to find and react to an Exit sign. You may think that there is some subtle cue or trick involved. Perhaps you suspect that she is reading my mind. But once, when trying to show her skill to our farrier, I held the Down card (each word is printed in large print on a sheet of paper,) and she did absolutely nothing. I thought maybe it was because of the distraction of a stranger. Then, the visitor asked, “Does it matter that you’re holding the paper upside down?” As soon as I turned the paper right side up, down she went! Another time, a neighbor dropped in to see her read. After I had her do a series of five or six cards, he asked if she would read for him. “I guess so, let’s try it!” I said. He called her, showed her the card for Sit; she sat. He was so tickled, he wanted to do more, and she responded correctly every time. Recently, I introduced photographs and she caught on to that immediately. When shown a photograph of herself OR ANOTHER DOG in a down, down she goes! The same with Sitting and Standing. 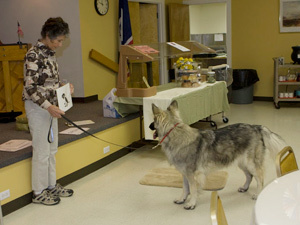 As well as making hospital visits as a therapy dog, Cady does regular demonstrations of her ability to read at the Senior Center here in Cody, Wyoming, (where the above photographs were taken.) One of these visits was featured in the newspaper, The Cody Enterprise. I am grateful to them for permission to use here some of the pictures their photographer took. When she’s finished a demonstration, I ask for a Finish, then a Stand. And I say, “Cady, take a bow!” She does—and then we share a “High Five” for a job well done. Cady also visits the elementary school near here. This month, after showing the children that she could read, a boy asked if she would read for him. Again, it’s “I guess so. Let’s try it.” He held up the Down card; down she went. He held the Stand card; she stood! He was so thrilled that now all the kids want a turn and we’ll do more of that next time. This is a wonderful way to teach children that dogs are more intelligent than they might have thought. Cady and I are hoping to teach the youngsters how to teach their dogs to read. Cady also demonstrated various training methods with hand signals and verbal cues, allowing many children to practice with her. Cady just turned two years old in November 2009. In most ways, she is very much still a puppy. So I am especially proud of her for being able to hold her concentration in a roomful of children who all love her and vice versa! And, while she may have a special ability for reading, your Shiloh can do it too! 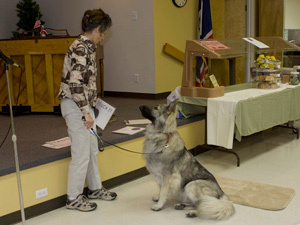 When surrounded by children all calling and reaching to her, when allowing a blind patient to slowly touch every part of her including her teeth and tongue and into her ears, when gently bending to a bedridden man in hospice, she exemplifies the temperament, intelligence and kindness of the Shiloh Shepherd. "